Tomato stains on your expensive Tupperware? Trying to reuse those takeaway containers for leftovers but they still have laksa stains on them? Mix lemon juice with baking soda to make a paste and cover the stains. Leave them alone for a couple of hours and wash those stains away. See more of LovePlantLife’s uses for lemons. I bake a lot and I make lots of sweets and chocolate. I also live in an old house, on a sand dune, where ants like to feel at home. So after any sugar-laden cooking session I need to clean up very well and I used to spend ages trying to get every last sugary morsel off the bench. I have since found an easier way. 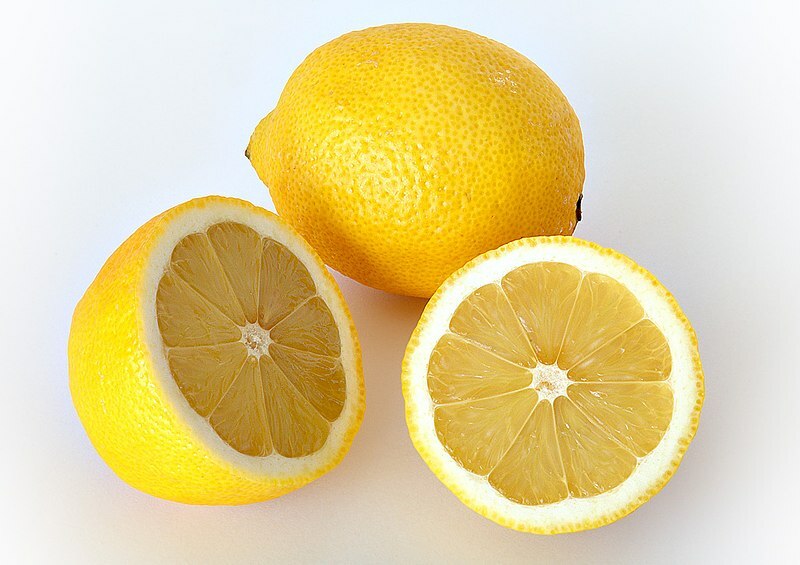 Chop a lemon in half and wipe down the bench with it. The lemon juice interrupts those devilish ant sensors and they just don’t come a’callin. Nasty things are reported to be found lurking in deodorant bottles-parabens, PEGs, hormone-disrupting fragrances and antibacterials, petrochemicals, aluminum compounds. So throw it out and use your lemons! Just slice one in half and rub it under those armpits. The antibacterial properties will keep you feeling lemony fresh. Does your favourite salad dressing call for raw egg but you’re a bit angsty because of the salmonella risk? Lemon power will save the day. Add 20ml of lemon juice per egg, stir gently and refrigerate the mix for 48 hours. You can store this mix in the freezer for up to 3 months. When you are ready to use, thaw the eggs in the fridge overnight. Image of a raw egg (after being soaked in vinegar for 48 hours) by Wikipedia user Biswarup Ganguly. If you’ve got lemons, chances are you’ve got too many of them. I hate to see fruit go to waste, so here’s a handy guide on what to do with your crop. And I started with the most important one – if life gives you lemons, then crack out the tequila! Despite a risk to the economy and an undisclosed cost to taxpayers, field trials of genetically engineered plants and trials on animals have resulted in next to no commercial gains by Crown institutes.